Under the provision of the moon, the earth and the sun. The visible side of the moon is illuminated in a larger or smaller portion. New moon is when the moon is between Earth and the Sun and therefore we don't see. In the first-quarter phase, the Moon, Earth and Sun form a right angle, so you can see in the sky only half moon, in its growth period. Full Moon occurs when the Earth is between the Sun and the Moon; it receives the sun rays on its visible side, therefore, is complete. Finally, in the waning half, the three celestial bodies re-form a right angle, so that you can see in the sky the other half of the lunar side. 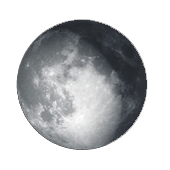 The phases of the moon are the different illuminations that our satellite presents in the course of a month. Earth's orbit at an angle of 5 ° with the moon's orbit, so when the moon is between the sun and earth, one of its hemispheres, the one we see, is in the dark area, and thus, it is invisible to our eyes: we call this new moon. As the moon continues its movement, it grows the illuminated surface visible from earth, until a week later shows the half of its illuminated hemisphere; it is called crescent. A week later we see all the illuminated hemisphere is called full moon. The following week, the illuminated surface begins to decrease or diminish, until reaching half: the waning half. At the end of the fourth week it reaches its initial position and disappears completely from view, to restart a new cycle.